Rock star Sting has called the X Factor "televised karaoke" and said judges like Simon Cowell have "no recognisable talent apart from self-promotion". The singer, 58, told London's Evening Standard that the Saturday night show was "a soap opera which has nothing to do with music". He added: "I am sorry but none of those kids are going to go anywhere, and I say that sadly." 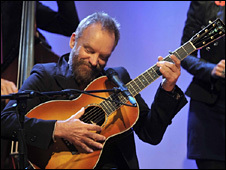 Sting rose to fame with The Police, but has also had a successful solo career. With albums like Ten Summoner's Tales and Nothing Like The Sun, he has notched up 11 Grammys, two Brits, a Golden Globe, an Emmy and three Oscar nominations. The Police, who recently reformed and performed a sell-out world tour, scooped five Grammy awards when they were together. Sting said the singers who participate in the X Factor, created by Cowell in 2004, were "humiliated when they get sent off". He added: "How appalling for a young person to feel that rejection. It is a soap opera which has nothing to do with music. "In fact, it has put music back decades. Television is very cynical." The singer, whose Fields Of Gold is a staple of talent show auditions, went on to say that X Factor encouraged contestants to "conform to stereotypes". He added: "They are either Mariah Carey or Whitney Houston or Boyzone and are not encouraged to create any real unique signature or fingerprint. "That cannot come from TV. The X Factor is a preposterous show and you have judges who have no recognisable talent apart from self-promotion, advising them what to wear and how to look. It is appalling. "The real shop floor for musical talent is pubs and clubs, that is where the original work is. But they are being closed down on a daily basis. It is impossible to put an act on in a pub. "The music industry has been hugely important to England, bringing in millions. If anyone thinks the X Factor is going to do that, they are wrong." A spokesperson for the X Factor declined to comment on Sting's interview, saying he was entitled to his opinion. Sting has just released a new album, called If On A Winter's Night, which is a collection of carols, lullabies and ancient songs. The star, born Gordon Sumner in Newcastle, took on many different jobs, including a tax collector and teacher, before he found fame at the age of 27. The musician's opinions are unlikely to sway the 15.4 million people who tuned into Sunday night's edition of the X Factor. 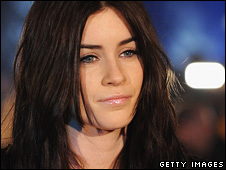 They witnessed Welsh teenager Lucie Jones lose out to Irish twins John and Edward via the public vote, after Cowell refused to make the call on which act to keep in the contest.